For other uses, see Our Town (disambiguation). Three years have passed, and George and Emily prepare to wed. The day is filled with stress. Howie Newsome is delivering milk in the pouring rain while Si Crowell, younger brother of Joe, laments how George's baseball talents will be squandered. George pays an awkward visit to his soon-to-be in-laws. Here, the Stage Manager interrupts the scene and takes the audience back a year, to the end of Emily and George's junior year. Emily confronts George about his pride, and over an ice cream soda, they discuss the future and they confess their love for each other. George decides not to go to college, as he had planned, but to work and eventually take over his uncle's farm. In the present, George and Emily say that they are not ready to marry—George to his mother, Emily to her father—but they both calm down and happily go through with the wedding. Wilder wrote the play while in his 30s. In June 1937, he lived in the MacDowell Colony in Peterborough, New Hampshire, one of the many locations where he worked on the play. It is believed Wilder drafted the entire third act during a visit to Zürich in September 1937, in one day, after a long evening walk in the rain with a friend, author Samuel Morris Steward. Wilder was dissatisfied with the theatre of his time: "I felt that something had gone wrong....I began to feel that the theatre was not only inadequate, it was evasive." His response was to use a metatheatrical style. Our Town's narrator, the Stage Manager, is completely aware of his relationship with the audience, leaving him free to break the fourth wall and address them directly. According to the script, the play is to be performed with little scenery, no set and minimal props. The characters mime the objects with which they interact. Their surroundings are created only with chairs, tables, staircases, and ladders. For example, the scene in which Emily helps George with his evening homework, conversing through upstairs windows, is performed with the two actors standing atop separate ladders to represent their neighboring houses. Wilder once said: "Our claim, our hope, our despair are in the mind—not in things, not in 'scenery.' "
Wilder called Our Town his favorite out of all his works, but complained that it was rarely done right, insisting that it "should be performed without sentimentality or ponderousness--simply, dryly, and sincerely." 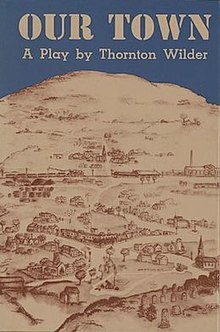 Our Town was first performed at McCarter Theater in Princeton, New Jersey on January 22, 1938. It next opened at the Wilbur Theatre in Boston, Massachusetts on January 25, 1938. Its New York City debut was on February 4, 1938 at Henry Miller's Theatre, and later moved to the Morosco Theatre; this production was produced and directed by Jed Harris. Wilder received the Pulitzer Prize for Drama in 1938 for the work. In 1946, the Soviet Union prevented a production of Our Town in the Russian sector of occupied Berlin "on the grounds that the drama is too depressing and could inspire a German suicide wave". Our Town was first performed on radio May 12, 1939, on The Campbell Playhouse. 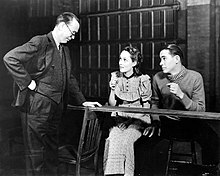 The cast included Orson Welles as the Stage Manager, John Craven of the original stage production as George Gibbs, and Patricia Newton as Emily Webb. Our Town (1940 film), adaptation starring Martha Scott as Emily and William Holden as George Gibbs, with an original music score composed by Aaron Copland. Many members of the original cast repeated their roles in this film, although the ending was changed so that Emily lived. Our Town (1940 radio), on May 6, 1940, a radio version was performed by many of the same film actors for Lux Radio Theater. Our Town (television), a live musical 1955 television adaptation on Producers' Showcase starring Frank Sinatra as the Stage Manager, Paul Newman as George Gibbs, and Eva Marie Saint as Emily. The first and only musical version of the play to be telecast. 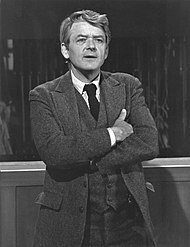 Our Town, a 1977 television adaptation of the play, starring Hal Holbrook as the Stage Manager, Robby Benson as George Gibbs and Glynnis O'Connor as Emily Webb. Grover's Corners, a 1987 musical adaptation performed at the Marriott Theatre. Our Town, a 2003 television film adaptation starring Paul Newman as the Stage Manager. It was shown on PBS as part of Masterpiece Theatre after first being shown on the cable channel Showtime. It was filmed at the Booth Theatre in Manhattan, where it played on Broadway in 2002. An award-winning revival of Our Town opened at the Barrow Street Theatre, in New York City, on February 26, 2009. The production was directed by David Cromer, who also performed the role of Stage Manager for much of the show's run. Upon closing, the production had played four preview and 644 regular performances, making it the longest-running production of the play in its history. In addition to Cromer, other notable actors who performed in the role of Stage Manager included Helen Hunt, Michael McKean, Jason Butler Harner, Stephen Kunken and Michael Shannon. In 1994, Philip Jerry choreographed a balletic adaptation set to the music of Aaron Copland and has been performed by the American Repertory Ballet in Princeton, New Jersey in the decades since its premiere. In 2017, Tony Award-winning Deaf West Theater, a Los Angeles-based theater company, co-produced with the Pasadena Playhouse a production of Our Town performed in American Sign Language and spoken English. ^ "Our Town: A History". pbs.org. Retrieved February 21, 2015. ^ "Our Town". Internet Broadway Database. Retrieved 2008-07-10. ^ The Pulitzer Board (1938). "Pulitzer Prize Winners of 1938". The Pulitzer Prizes. Retrieved 2008-07-10. ^ (tsalagicelt) (30 May 1977). "Our Town (TV Movie 1977)". IMDb. ^ W. Jones. ""Great Performances" Our Town (TV Episode 1989)". IMDb. ^ "Our Town". Playbill.com. Archived from the original on 2010-09-18. Retrieved 2010-12-12. Wikimedia Commons has media related to Our Town.